"Absolutely loved staying here, and would heartily recommend..."
"The hotel location is convenient and it is quite near to Hakodate Mountain." "The hotel offered the best service I ever encountered in a hotel and I traveled a lot all over the world." 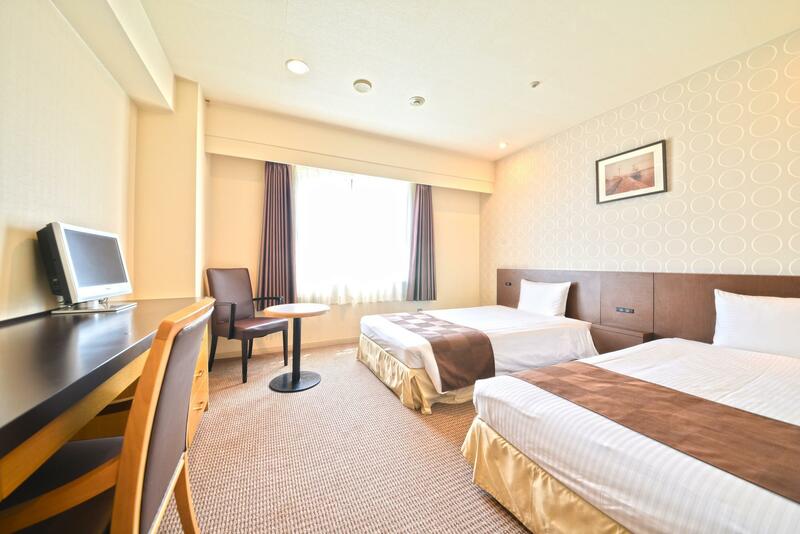 Hotel WBF Grande Hakodate, located in Hakodate Bay, Hakodate, is a popular choice for travelers. Set 0.5km from the excitement of the city, this 3.5-star hotel commands an excellent location and provides access to the city's biggest attractions. Also within easy reach are Hishii Furukimono Nado Nado, Hakodate Motomachi Historical Area, Hakodate Community Design Center. At Hotel WBF Grande Hakodate, the excellent service and superior facilities make for an unforgettable stay. To name a few of the hotel's facilities, there are free Wi-Fi in all rooms, laundromat, Wi-Fi in public areas, car park, restaurant. The hotel features 136 beautifully appointed guest rooms, many of which include television LCD/plasma screen, carpeting, linens, mirror, slippers. The hotel offers many unique recreational opportunities such as massage. With an ideal location and facilities to match, Hotel WBF Grande Hakodate hits the spot in many ways. "Loved the breakfast and the onsen facility." It takes 40 minutes by public shuttle bus and costs JPY 460 per person. Good room with good facilities. Breakfast was traditional Japanese with a very good choice of foods. The hotel is close to the tram stop and there was a good choice of restaurants nearby. All good. We would stay with them again. Appreciate for staying our hotel in this time. We are so happy cause you satisfied our hotel and service. We will do our best to service more better for guest who will stay our hotel from now on, so please stay agian at our hotel when you come again at Hakodate. Thank you so much to writing a review while you are busyin :) - Front, PArk. There is limousine bus direct from hakodate airport. The hotel provide free amenities like bath salt, hand cream, face mask, etc not only for womem but also for man :) also free yummy pudding. The surrounding is very quite but beautiful if you like to walking around. The room quite big for family of 4. Appreciate for staying our hotel in this time. We provide coffee, tea, and dessert at lobby for free. We will so happy you fulfill our hotel's service while you stayed. We will do our best from now on to service better. Hope you make a great time at Hakodate! Thank you so much to write a review while you are busying :) - Front, Park. A bit distant from JR station(about 15-20 minutes’ walking)but relatively closer to several tourist spots. We loved the sea view outside the window.! Close access to the JR station via the street car. The location was near attractions and within walking distance. We only stayed for one night so visited the red brick warehouse and took the bus to Mt Hakodate. All easily accessible from the hotel. There is also free coffee and tea and also desserts in the lobby. Appreciate to staying our hotel this time. We services free coffee and dessert at the lobby for guests who staying our hotel. Did you make happy time during your travel? We hope you will come again to Hakodate. Thank you so much to writing a review while you are busying :) -Front, Park. Absolutely loved staying here, and would heartily recommend this hotel. It's not the cheapest around (nor the most expensive) , which in advance had me raise my eyebrows a little, but once we arrived and saw the room I completely understood. Looks way better in reality than it does in the pictures. Appreciate for staying our hotel in this time. We are so happy cause you satisfied our service. We will do our best from now on to service more better. We look forward to you coming at Hakodate again. Thanks a lot to writing a review while you are busying. Happy new year! :) - Front, Park. You’d have to walk to most attractions and restaurants. The view is nice but the lobby reminds me of YMCA. Some staff who can speak English were helpful ,but the one who doesn't will make sure you don’t bother them again . Appreciate for staying our hotel in this time. We are so sorry to you for inconvenience by discussing. We will do our best from now on to satisfying guest who will stay out hotel. Thank you so much to writing a review while you are busying. - Front, Park. There has a shuttle bus to arrive at the hotel directly. A little far away to the centre city, but it has subway very convenient and nearby the cable car to see the beautiful night view on Mt. Hakodate. Nice & clean hotel. We asked for a non-smoking & higher floor room. We have seaview from our room window. The wifi in the room is strong. The water pressure (shower) is strong although we are staying at the highest floor. The toiletries provided are good in quality. Each room has provided a smartphone, guest is free to use & bring along during the stay. We used it (map) to guide us back to the hotel from the dinner place. We have a pleasant stay here. Dear customer，thank you for choosing our hotel during your precious time in Hakodate. We would also like to thank you for your kind comments. We are look forward to serving you again. Pros: hotel room is of decent size, clean and great view from the room window. Near to most tourism area in Hakodate. Street car or tram is just about 200m walk. There's a convenient store just opposite the hotel. Free coffee and organic jelly 24 hours. Coin laundry and dryer available at the 1st floor. Cons: not so much eateries around. Thank you for your stay. It is a great honor to have praised so much. I am very happy you enjoyed Hakodate. Also, please come to Hokkaido. Thank you for posting. It's convenient to get to Hakodate Mountain. Can take a 10-15min walk to Hakodate Mountain cable car. It's 5 min walk distance to a tram station. The hotel provides great services, such as selling one-day tram ticket, complimentary dessert, hot spring powder, and tourist information. Thank you for your stay. Also, please tell the charm of the hotel Thank you. I am very happy to have you satisfied. All you can dessert free, coffee's all you can drink, ease of spending I will pursue it. Thank you for your contribution. The hotel although is a bite old but still maintain a very high standard. We book a deluxe double room with breakfast. Room size and bed size is good and spacious. Breakfast is good. Staffs are very helpful. Location is very convenient with streetcar and also by walking distance. Highly recommend this hotel with very reasonable price and worth a penny. Thank you very much for staying with us this time. A lot of compliments of praise are very glad. Thank you for the highest rating. I enjoyed Hakodate and I was able to stay slowly The whole staff is pleased. Please come to Hakodate once more. Until then, take care. A good and nice hotel. The airport bus stop right at the doorstep of the hotel. Though location is a bit from JR station, its near to tram and bus station. 10 minutes walk to Mt Hakodate cable car. Free dessert and self serving coffee, tea machine in the hall. The breakfast is excellent. The handy phone is a plus especially for foreign travelers like us. Thank you for staying with us this time. Also, thank you for letting us know the charm of our hotel. Hakodate could have fully enjoyed it? Night view and church group · Kanamori warehouse We were fortunate if we had a lot of memories. I appreciate the delicious breakfast and praise. I hope to see you again someday. Thank you very much. Take care. The hotel charged 1000 Yen perday for overnight parking. This hotel provide playing area near the hotel lobby for young children. Overall the hotel is good but the room is a bit small for 2 adults + 1 young children. Dear customer,thank you for choosing WBF Grande Hakodate hotel. i was travelling with my mom. the staff was able to communicate in simple english but they made the effort to communicate with us using google translate when we asked how should we go hakodate mountain when the cable cars are having service maintenance now. i will go back again when i am in Hakodate. The hotel location is convenient and it is quite near to Hakodate Mountain. Lawson is just right opposite the hotel. Do note the hotel will charge additional parking fee at 1,000 yen per day if you are driving. Great location hotel. Within walking distances to the ropeway and warehouse attractions. Airport bus is just right at the doorstep. Satisfied with overall stay here but the staff cannot fully understand English so you might have to make sure they really understand your need. For example, we booked a taxi to pick us up in the early morning at the hotel reception a night before, in the next morning the male staff (different staff who booked a taxi for us) didn't know that we had booked a taxi. I guess the communication between staffs may be limited too. Apart from that, the room is big and nice, but seems old. You need to take a tram around 3 stations and a 5 mins walk to get here. The good point is, you can just walk to the ropeway from this hotel. Be early for it because there might be a very long que to get up there. Thank you for staying at Hotel WBF Grande Hakodate this time. I am waiting for you to come again.